Van Gogh i bPáras sa bhliain 1887. Ba mhinic nár scríobh sé ach "Vincent" mar shíniú. 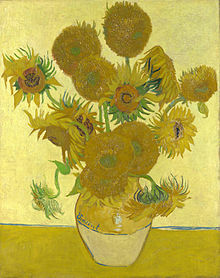 Péintéir Iar-Impriseanaíoch Ollannach a bhí i Vincent Willem van Gogh (30 Márta 1853 – 29 Iúil 1890). Tá a shaothar i measc na cinn is cáiliúla agus is daoire riamh, mar shampla Lucht Ite Prátaí, Lusanna gréine, An Oíche Réaltach, Feileastraim agus Portráid den Dr. Gachet. Bhí fadhbanna meabhairshláinte ag van Gogh agus is iomaí caint a tharraing a shaol príobháideach. Mar shampla, ar an 23 Nollaig 1888, tar éis achrainn le Paul Gauguin, bhain Vincent van Gogh píosa as a chluas féin. Fuair Vincent Van Gogh amach ag an am sin go raibh a dheartháir Theo ar tí pósadh agus bhí aigne Vincent ina cíor thuathail (bhí eád air b'fhéidir). Níos déanaí, chuir van Gogh lámh ina bhás féin san Fhrainc sa bhliain 1890. Ba chruálach mar a fuair sé bás go hóg. Rugadh Vincent van Gogh ar an 30 Márta 1853 i Groot-Zundert, san Ísiltír. Rugadh Vincent bliain amháin go dtí an lá ó fuair a dheartháir mór, a raibh an t-ainm Vincent air fosta, bás. Bhí beirt dheartháireacha, Theo agus Cor aige agus triúir deirfiúracha, Anna, Elizabeth agus Willemien. Bhí a athair Theodorus ina mhinistir Protastúnach agus ba ealaíontóir í a mháthair Anna. Uaithi a fuair sé an grá agus tallann mhór a bhí aige don ealaín is dócha. Ag aois a 15, bhí deacrachtaí airgeadais ag an teaghlach agus b’éigean do Vincent an scoil a fhágáil agus dul ag obair. Fuair sé obair le comhlacht ealaíne a uncail sa Háig. Faoin am seo bhí Vincent líofa i gceithre theanga, an Fhraincis, an Ghearmáin, an Béarla agus an Ollainnis. Sa bhliain 1873, mar chuid dá obair, chuaigh van Gogh chun cónaí i Londain. Thit sé i ngrá le cultúr Shasana agus bhí dúil mhór aige i scríbhneoireacht Charles Dickens agus George Eliot. Nuair a bhí sé i Londain thit sé i ngrá le Eugenie Loyer. D’iarr sé uirthi é a phósadh ach dhiúltaigh sí é.
Tháinig gruaim uafásach ar Vincent ina dhiaidh sin. Chaith sé ar shiúl gach leabhar a bhí aige ach amháin an Bíobla agus shocraigh sé go gcaithfeadh sé a shaol i seirbhís Dé. D’éirigh sé feargach le daoine ag an obair agus ba ghnách leis insint do chustaiméirí gan an ealaíon beagluachach a cheannach. Gan mhoill tugadh bata agus bóthar dó. Thosaigh Van Gogh ansin ag teagasc i scoil buachaillí agus ag cur suim sa reiligiún. Rinne sé staidéar le bheith ina mhinistir ar feadh bliana ach dhiúltaigh sé na scrúduithe Laidine a dhéanamh. Dúirt sé gur teanga mharbh a bhí inti. Chuir sin deireadh leis an smaoineamh sin post a fháil san Eaglais. I bhFómhair 1880, shocraigh van Gogh ar bhogadh go dtí an Bhruiséil agus ar a bheith ina ealaíontóir. Cé nach raibh aon traenáil fhoirmeálta aige, thosaigh sé ag déanamh staidéar ar an ealaín é féin agus d’aontaigh a dheartháir Theo ar chuidiú leis ó thaobh airgid de. Bhog Vincent go Páras agus isteach lena dheartháir Theo. Ba ansin a chonaic sé ealaín impriseanaíoch den chéad uair. Rinne sé cairdeas le healaíontóirí eile ar nós Henri de Toulouse-Lautrec, Camille Pissarro agus daoine eile, ach go minic thit sé amach le healaíontóirí eile fosta nuair a rinne sé cáineadh ar a saothar. Chuir van Gogh suim mhór in ealaín na Seapáine agus bhí brionglóid aige taisteal go dtí an tSeapáin. Dúirt Toulouse-Lautrec leis go raibh an solas i sráidbhaile Arles díreach cosúil leis an solas sa tSeapáin. I Feabhra 1888, chuaigh Vincent ar thraein go deisceart na Fraince agus bhog sé isteach sa “teach buí”. Chaith sé a chuid airgid ar phéint agus ní ar bhia. Faoin Nollaig, bhí sé beo ar chaifé, arán agus deoch alcólach darbh ainm absinthe agus tháinig meath mór ar a shláinte fhisiciúil agus mheabhrach. Bhí imní ar a dheartháir Theo agus d’íoc sé an t-ealaíontóir Paul Gauguin as dul go Arles agus súil a choinneáil ar Vincent. Taobh istigh de mhí bhí an bheirt acu ag argóint an t-am ar fad agus d’fhág Gauguin. Ag an am sin, ghearr Vincent a chluas féin de. Tugadh Vincent chuig an ospidéal ach ní raibh sé mar an gcéanna riamh arís. Bhuail gruaim é. Thriail sé pictiúir den dúlra a phéinteáil le dóchas a thabhairt dó ach ba mhinic é ag pilleadh ar an ospidéal mar gheall ar a shláinte. 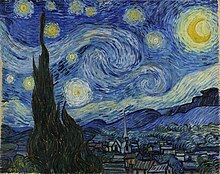 ↑ "The real reason Van Gogh cut off his ear" (en). The Independent (2016-10-31). Dáta rochtana: 2018-12-23. Tugadh an leathanach seo cothrom le dáta an 23 Nollaig 2018 ag 23:55.